Jeff Raikes, former CEO of the Bill & Melinda Gates Foundation and co-founder of the Raikes Foundation, said it’s not hyperbole to say that global society is experiencing a data revolution. But that the revolution has yet to reach agriculture. It’s not surprising the former Microsoft Corp. executive believes in the power of technology, and in particular Big Data. But it’s his experience as the son of a farmer that led him to focus on how technology can help farmers increase yields, improve their livelihoods and collectively meet the food production needs of the world’s people. 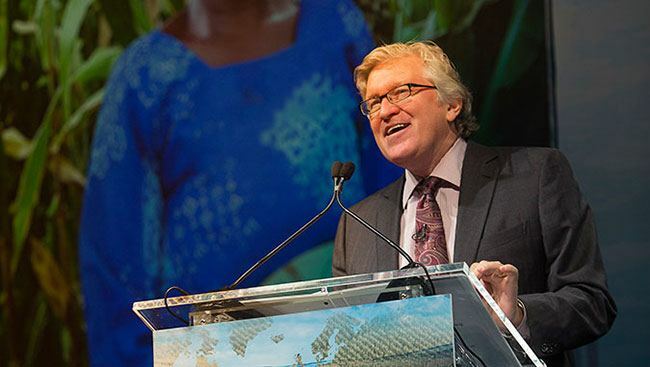 Raikes gave the keynote presentation at the 2014 Water for Food Global Conference, in Seattle, Wash. on October 20. The demand for food is expected to double by 2050 as the world’s population barrels toward 9 billion people and increasing incomes allow many more to afford a better diet. Lack of water is a critical constraint. To help solve this enormous challenge, the agriculture and water communities are harnessing Big Data to ramp up food production with less pressure on our water resources. The conference is highlighting ways in which Big Data is helping create a more water and food secure world. Precision agriculture: Precision agriculture defies the stereotype of farmers as low-tech traditionalists. Today, a host of technology, from GPS-equipped tractors to remote-controlled or even automated irrigation systems, is turning farming into a high-tech business. Computer-equipped combines gather data during harvest to create detailed yield maps, which are used to create a precise prescription of fertilizers and other inputs to improve productivity the following year. Such advances translate into higher yields using less water and energy. And, this high-tech nature of agriculture, along with its important role in feeding the world, is attracting young people back to farming. Smallholder farmers: Raikes said he “despises” the notion that high-tech solutions won’t be available to small, subsistence farmers in developing countries. Greater computing power is allowing researchers to sequence plant genomes faster and cheaper than ever, for example, leading to more drought- and pest-resistant crop breeds, including those prevalent in sub-Saharan Africa and southeast Asia. Leapfrogging technology: Many farmers in poor, rural areas, long isolated by insufficient phone service and roads, have cellphones. With these mini-computers in their pockets, they now have access to weather forecasting and market information to make better decisions, manage money and develop a wider support network, thereby improving livelihoods, as well as local water and food security. Mapping: Countries are also taking on Big Data projects, such as regional mapping, to improve policies and better plan for the future. The Gates Foundation supports the Africa Soil Information Service, which is developing continent-wide digital soil maps using both historic and new soil data and analyses. Other speakers described soil, flood and other mapping projects in Central America, India, Nigeria and elsewhere. Satellite imagery and data: Farms, big and small, already benefit from satellites that gather vast amounts of data. Satellites can track atmospheric patterns, precipitation and ocean currents. Combined with weather data, researchers are using satellite data to develop better forecasting and risk-management tools to help farmers, whether in Nebraska or Ethiopia, make better decisions, and to help governments better plan for droughts and floods. Groundwater monitoring: Globally, agriculture consumes 70 percent of all freshwater withdrawals, primarily for irrigation, and groundwater is a key source of irrigation water. Data regarding aquifer conditions, groundwater withdrawals and other metrics are critical for water managers to prevent catastrophic aquifer depletions. Much data is flowing in agriculture, creating numerous opportunities to increase food production without compromising limited water resources. But many challenges remain to ensure the data flows efficiently and equally to those who need it most. It’s not enough to sit and talk about smallholder farmers, Raikes said. They must be included in the revolution and participate in developing solutions if those solutions are to be effective and adopted. Mobilizing Big Data to improve global water and food security is the subject of the 2014 Water for Food Global Conference hosted by the Robert B. Daugherty Water for Food Institute at the University of Nebraska in association with the Bill & Melinda Gates Foundation being held Oct. 19-22 in Seattle. Molly Nance is the director of communications and public relations at the Robert B. Daugherty Water for Food Institute at the University of Nebraska, a research, education and policy analysis institute created to address the global challenge of achieving food security with less pressure on water resources. To view more photos, visit the Water for Food Facebook page. Live streaming is available on the Water for Food Youtube page.